If you’d have told me that a highly touted European prospect in 2013 would become the biggest star in combat sports, and one of the biggest stars in all of sport, I’d have highly doubted you. Conor McGregor, a multiple weight division champion in the European regional scene, came in with a lot of hype (a lot of it from his own mouth) and high expectations. In a short period of time he went from being an undercard fighter to headlining a card in Dublin, Ireland. In an even shorter amount of time he went from newly christened Top 10 fighter to featherweight champion of the world and then the first concurrent two division champion in UFC history. This past summer he headlined the biggest freak show fight of them all, a boxing fight against Floyd Mayweather. As 2017 ends, McGregor’s future in MMA is uncertain but promising. And that describes the documentary, which he produced, about him. 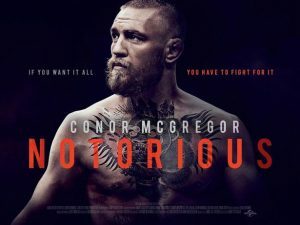 It begins very promising, with behind the scenes footage of him as a struggling fighter living in his parents’ basement with his girlfriend supporting the two of them, and follows his career, and gives us a behind the scenes access from his final days in the regional scene to the buildup to the Mayweather fight. The problem is that after those early days, of him struggling, all we get is a manicured look at the rise of McGregor. This is about as big a puff piece as possible; it’s a polished take on McGregor that puts him in the best possible light no matter what. And that’s the problem. This is nothing but McGregor is the greatest and the narrative that’s been spoon fed throughout his career by the UFC Public Relations team. Anything that puts him in a bad light, including his “thanks for the cheese” Tweet amidst contract negotiations with the UFC for the Nate Diaz rematch, is either ignored or cast in the most favorable light possible. It’s understandable, considering this is a McGregor produced property, but it doesn’t give us any new insight into MMA’s biggest star. It’s just behind the scenes, without much context, as we follow the rise of McGregor to his point right now. Some of the footage lends new perspective to some of his biggest fights, most significantly a substantial knee injury that he dealt with in the leadup to the Chad Mendes fight, but this is all highly manicured. Everything is designed to give you the perspective that McGregor can conquer all, etc, and it’s not surprising. McGregor’s career has been remarkable up to this point and this is the most positive lighted viewpoint possible of it. Notorious is currently playing for a one night engagement tonight.